Putting two foodies in a flat with three typical students can occasionally have disastrous consequences. It seems that Goon’s dislike for his squeamish blonde flatmate ran a little deeper than I thought. True, she did throw away the pheasant pasta that was supposed to be his lunch because she didn’t like its smell. True, she does appear to have a cleaning OCD and whines constantly. True,she does squeal and make yuck faces at us and our food (particularly offal), before tucking into processed sausages and burgers. And true, she whinges it’s ‘horrible and mean’ to eat wild rabbit but doesn’t mind eating intensively farmed animals. But apart from that there’s not that much to dislike about her. I can totally see why this flatmate irritates the hell out of Goon. She irritates me too. This is why I couldn’t stop laughing when this happened. On Thursday I popped round to our local fishmongers with Goon to choose something for dinner. I had my eye on the John Dory but Goon disagreed. GOON: No. The stripy fish. ME: But there’s a Gordon Ramsay recipe I want to try for this John Dory. GOON: No! The stripy fish. ME: Do you even know what the stripy fish IS? ME: It’s mackerel. 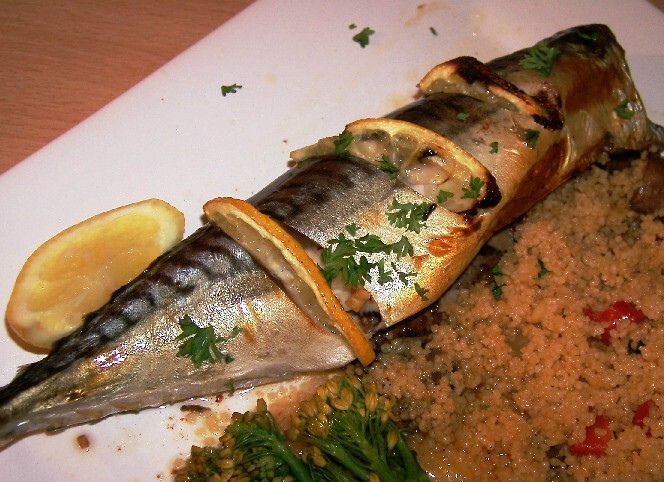 Do you even like mackerel? And there you have the Goon way of winning an argument. You have to agree that it is effective. To be honest, I was happy enough with mackerel. They are tasty and cheap. I decided cook them simply, so studded them with slices of lemon (a slice went inside each cavity too), baked them and made a garlic and chilli infused oil to drizzle over them. Ok, I admit Goon is right. They are very pretty fish. Recently, inpired by the River Cottage Meat book, I have been trying to make as much use of our food as I can. In particular, I’ve been trying to make stocks from all my leftover whole animals. I hadn’t got around to making fish stock before so I’d asked the fishmonger to just gut our mackerel and leave me the rest. I thought the bones, leftover skin and heads would make great stock. That evening, whilst cooking, I told Goon to cut off the fish heads pop them in a bowl with clingfilm to use later. Instead, Goon decided to torment his other squeamish (but not at all irritating) flatmate with them for a while. It seems that to the right people, a pair of fishheads by a door is a better barrier than an electrified fence. After our meal, I told Goon to put all the fish leftovers together, covered, in the fridge so I could make my stock the next day. And that, I thought, would be the end of it. It appears that Goon had other, slightly mean, but extremely funny ideas. Apparently Miss Squeamish got up the following morning at 5:45am, opened the fridge door and found…..
the two heads of our mackerel, placed with care in the cheese box so that when you opened the fridge they were staring straight back at you. Apprently the scream woke up the whole flat and possibly some of the neighbouring ones too. The fish heads got binned, which was a shame, but worth it for the amusement it caused us. Hehehe. If it had been anyone else, I might have felt sorry for them The prissy one currently appears to not be talking to Goon. Goon is happy with that and to be honest, we’re finding it hard to not provoke her again. After all, I still have those octopuses in the freezer and they will have to be defrosted at some point. That should be fun. Hmmmm….. I wonder what would happen if I got myself a couple of lobsters (a treat I’d been saving for when I had a flat of my own) and put them in the bath. Thesis draft 2 is finally in! \o/. Now I can finally emerge from my relative silence. To those of you that I’ve been ignoring over e-mail etc, my sincere apologies. It really has been THAT hectic over the last two weeks. Tuition sessions have also settled down a little (she says returning from teaching until 9pm :s) so I have time to blog again . Of course, whilst sleeping and generally living became low of my priority list, cooking certainly didn’t (except on the one day that Goon demanded Chinese take away) so here a few of the things I really wanted to blog about but couldn’t. My favourite of the week was this. Between teaching sessions on Saturday morning, I managed a quick detour through Shepherds Bush market, picked up some goat, which went into a Jamaican goat curry and the lovely red sea bream you can see in the picture above. The fish only cost £4, which is a lot cheaper than the supermarket bream I’ve seen. That evening the fish was marinated in orange and ginger, grilled until the skin was cripy and served on egg fried rice with a sweet and sour sauce and some prawn crackers. Of course, with Easter weekend came a host of supermarket special offers, including half price duck. This, in imitation of a very good pub lunch I had, was rubbed with star anise and then roasted with cloves and cinnamon under its skin. I served it with a pear chutney and attempted to make ginger flavoured roast potatoes, although the ginger turned out much more subtle than I’d hoped. I always have trouble making things taste of ginger. Any tips on that front would be much appreciated. Also, I took advantage of a half price lamb leg which was the principal ingredient in this rather colourful dish. The whole leg was crusted in a mixture of coriander seed, cumin, fennel, and turmeric, roasted to rare (for a change) and served with vegetable couscous, a sweet red pepper sauce (recipe adapted from Sher’s at ‘What Did you Eat?’) and minted courgettes. Finally there was the super-lemony guinea fowl. Super lemony because, before I roasted it, I slipped very thin lemon slices (and herbs, garlic and butter) under its skin. For some reason lemon seems to keep poultry really moist if you squeeze it on before cooking. In the case of my guinea fowl, the juice of the lemon trickled out over the flesh during t cooking and kept it really succulent as well as giving it a great flavour. As usual, giving the skin a stuffing make it go very crisp. I also shamelessly stole this fab idea for mussels with leeks and blue cheese from Anna at Morsel’s and Musings. I omitted the spinach and served my version over some linguine. My picture didn’t come out well at all. My mussels glowed so much they looked radioactive. I don’t mind too much though, as Anna’s green lipped mussels look way better than the ones I had to buy from Tesco. So there we go, a selection of the things that kept me sane during the nightmare that was the last ten days. Since things are much calmer now, I’ll hopefully be able to tell you abou my visit to Market Kitchen soon and the exciting time I’ve been having with my new favourite food book. This was the second of my late night midweek dinners that grew into something unexpected. These pigeon breasts had been sitting in the freezer from the time I made my unfortunate bastilla. Since there was just enough for one, it seemed sensible to use them while Goon was away. As usual, as the onion was caramelising, I had a nose through everything else on the worksurfaces and in our cupboard. This time I discovered one of our mostly finished bottles of plum wine, which I had bought in Borough Market. I could see the plum flavours working very well with the gaminess of the pigeon and the sweet onion. Usually I wouldn’t add fruit wine to food as it is a bit pricey and I have to go all the way to Borough to get more, but this one needed to be used soon. Plus, those bottles are STRONG with 14.5 % alcohol. I knew what would happen if i started drinking it by myself and I figured that adding a hangover to my already hectic week would be a bad idea. So my remaining third of a bottle of wine went into my saucepan, not my mouth and, as I let the wine bubble down, the onions turned a very pleasing shade of pinky-purple.This on its own made me love this dish! A quick taste revealed that the sauce was crying out for star anise and cinnamon, so I ground a teaspoon of each and added them to the pan. Finally, I seared the pigeon breasts to medium rare and tossed them in the reduction which by then was very thick. I think an tangy orange dressing on my rocket and potatoes would have been best to offset the rich sweetness of the pigeon dish but I had no oranges and so a bog standard balsamic vinaigrette had to do. The sweet-tangy combination still worked very well. This was another one of those dishes that I need to make again. I believe it’s got potential to be really good if I ever get the time to think about it properly. The pigeon itself was great but could have been better with some marinating and a citrus dressing on the salad would have been better. However, in this state it was a very nice midweek dinner and fairly quick to make, which is just what I’ve needed this week. It’s been a funny old week. I thought that since half my students were going on holiday I’d have loads of free time. But it seems the few remaining ones had other ideas. Ideas involving three hours of tutorials a day. Each. I have been starting teaching at 9am and finishing at around 9pm, with a few hours in between to hurriedly type thesis. In the midst of all this I got a call from these guys at Market Kitchen. Apparently I will be on the telly soon. More on that when I know what exactly is going on. To add to the already huge stress levels, Goon has been away this week, working in Newcastle for his web-hosting company, Byethost. I thought this would mean that cooking for me this week would be reduced to quick and fairly boring meals as there was no way I could cope with arriving home at 10pm, getting up at 8am, cooking properly and cleaning up the kitchen. It seems however that I was wrong. The basic meals took on a life of their own. For the first night, I had a fresh tuna steak. I thought this was perfect for my situation. It would be quick to cook and still really tasty. My plan was to just sear it and have it with new potatoes and a salad to give myself time to sleep that night, but then an idea struck me. My dad had brought me some gotu-kola leaves the previous weekend. I guess this is a bit of an obscure plant. 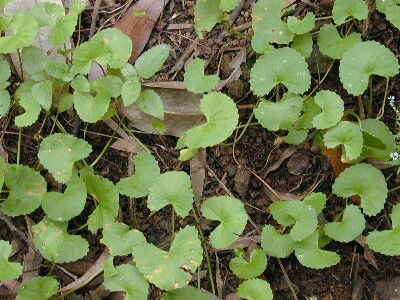 It goes by a variety of names, including, Antanan, Brahmi and, over here, we have a close relative of it called pennywort. The leaf is important in Ayurvedic and Chinese medicine and, in Sri Lanka, the leaf is used in salads and also blended with coconut to make a breakfast drink. I hadn’t eaten these leaves since my childhood and, when I tried them from the box in the fridge, I remembered why. They are a bit of an acquired taste, at least on their own. Adding a little bit of dessicated coconut and lime, however, gives the leaves a new lease of life. The sweetness of coconut balances the leaves’ bitterness and the lime gives it a pleasant freshness. This flavour combination was the basis of the spontaneous idea I had to jazz up my dinner. I scored my tuna steak and left it to marinate briefly in a blend of chilli oil, grated ginger, garlic and grated lime zest. The gotu-kola leaves went in the blender. I blitzed them, adding coconut milk slowly until I had a pesto like consisitency. I also blended in a couple of teaspoons of grated coconut, some lime zest and a little fresh red chilli. The result was very interesting, in a good way. The bitterness of the leaves had gone but the distinctive ‘medicinal’ taste was still there. I tried to find some rice noodles in my cupboard, failed and settled for spaghetti instead and tossed the cooked stands in my makeshift pesto. The balance of flavour here was really good. There was the classic gotu-kola, coconut, lime combination balanced by the ginger and chilli in the tuna. I think more ginger was needed somwhere but, other than that, I couldn’t complain about this dish. I also made a quick tomato and aubergine side dish with coriander, which, again, because if its sweetness, completmented the gotu-kola flavour really well. This was a suprising success for such a random idea. I think I’ll work on it because there’s potential for an interesting and tasty Sri-Lankan- British fusion dish. Also, since it contains a weird and relatively unheard of plant, it is perfect for Kalyn’s Weekend Herb Blogging which, this week is hosted by Anh from Food Lover’s Journey. I found an interesting fact about the leaf as I researched it for this post. Apparently in ancient times it was regarded as a natural version of viagra. A story tells of a Sri Lankan king, Aruna, mustering the energy to satisfy his harem of fifty on the powers of the gotu-kola leaf. More believably, the leaf also promotes the healing of wounds by speeding up the scarring process and is an anti-oxidant. Unfortunately things haven’t eased off on the work front quite yet. My impending deadline was revoked when, in a fit of utter frustration, I visited my supervisor to inform him that I was getting nowhere with the proof he asked me to complete. It turned out there was a good reason for this. There had been a slight discrepancy between what he had ASKED me to do and what he actually MEANT, which meant that I’d spent the last two weeks trying to do something that was probably impossible. Such is the world of academia I suppose. At least I’m now on the right track and, since Goon has exams in a few weeks, he is spending most of his time at home revising learning the material. I thought that meant that I could indulge in some slow-cooked food as Goon was there to put things in the oven and keep an eye on them. I first took advantage of this by trying to make a simple but rich dish of beef stewed in red wine - a bourguignon type thing adapted to include whatever vegetables and wine I had in the kitchen. I left the beef marinating in a rich, mellow red with the partially cooked veg and gave Goon the instructions to brown the beef, return it to the casserole with the wine and put it in the oven at 150C, adding a little stock if it looked like it would dry out. You’d think that with such a simple dish nothing could go wrong. You’d be mistaken. I arrived home at about 9:30pm after failing yet again to finish my Chapter 4. Goon wasn’t around. I tutted, thinking he should have stuck around to check on the food, especially since it turned out that he’d left the dish in the oven uncovered. Closer inspection revelaed that things were much worse than I thought. The extremely large casserole dish was full, and I mean FULL of liquid. I had intended to cook the beef in almost pure red wine but it looked like Goon had added a couple of litres of something to it. I removed dish from oven and tasted. Something inside me died. My beef was cooking two litres of plain water! I panicked. There was far too much water to boil away. My best option would be to drain the beef as soon as possible, replace the cooking liquid with something appropriate and give it some extra cooking time so it developed a flavour. That is exactly what I tried to do, grabbing the nearest bottle of red from the worksurface. I relaxed slightly and tasted again. Who’d have thought we’d have a bottle of red wine out that was OFF!? It was at this point that Goon walked into the flat and immediately had to duck as every kitchen implement I could lay me hands on went flying at high speed towards his head. Once he’d taken cover in his room I drained the casserole again and found an unopened bottle of red, tasted that and added it to the dish. I was seriously worried that the food was going to be inedible. The casserole had retained some of the flavour of the slightly vinegared wine. Goon, who’d stopped hiding in his room, wandered into the kitchen, picked up a spoon and tasted the casserole. I very nearly killed him. At this point the casserole turned into a stew and I did everything I could to save it. In went extra tomato and garlic plus a couple more bay leaves. I put it on the lowest heat possible and gave it another hour to see if it recovered. Suprisingly, the tartness did start to soften. I added extra herbs and black pepper and a little bit of lamb stock, which really helped to alleviate the sharpness of the dish. In the end we actually had an edible and actively pleasant meal, although not nearly as good as I had wanted it to be. It took AGES for the flavour to recover and we ate at about 11:30pm, but still, it was better than beef cooked in water or off wine. So the lesson for today was, if the wine for your bourguignon is a bit tart, lamb stock, winter herbs, bay leaves and garlic seem to really help. Also, even the most simple instructions can be misinterpreted by a Goon. After the whole casserole fiasco (post above) and a certain comment he made about my cooking (see this post), I was in a very bad mood with Goon. Moreso because he didn’t seem to want to apologise and he spent the next day sulking, refusing to help with any of the household chores and definitely not helping in the kitchen while still expecting me to feed him. Grrr! Men! I had an easy way to solve this problem. If you’ve been a regular reader of this blog you’ll know that Goon has a lot of trouble cooking without supervision. If I were to stop cooking for him he’d either live on takeways or his previous diet of tinned tuna on rice and plain noodles cooked in stock. The easy way to stop him sulking would be to refuse to cook for him at all. But that wouldn’t be as fun as what I decided to do. Again, regular readers will know, Goon hates lightly cooked liver, okra, and very spicy food. Since Goon was refusing to come into the kitchen I had no problem in producing this for dinner that night. That’s lightly cooked chicken livers in an extra-hot peri-peri sauce with added okra thrown in. It’s garnished with big slices of red chilli. Mwahahahaha! I told Goon the next night we’d have gumbo, the night after that a beef and bhindi phall perhaps followed by some type of liver curry. It turned out I didn’t need to hold up my threat beacause Goon turned from sulky to apologetic very quickly. Flowers even appeared the next morning. Hehehe. I win. Plus the peri-peri chicken livers were actually delicious if you don’t have some weird anti-chilli or anti-liver complex. If I can finish a chapter of my thesis before my next student arrives I’ll write up a recipe for it. However inclusive you try to make a blogging event, there’s always one moron that’s going to be totally confused by it. In the case of this month’s ‘Waiter, Waiter’ event, that was me. The theme for this round of the event is ‘’Waiter, Waiter, there’s Something in My Easter Basket.” I am good at ignoring public holidays. I managed an excellent job with Christmas this year and my efforts were only thwarted by my parents who found it totally unacceptable that I would be spending the with only the internet for company. I find Easter much easier to ignore. Apart from the shutting of shops (and College) on Easter Sunday, I go about my life as usual. I’m even tutoring on Easter Monday. Unfortunately, that meant that when Johanna, the Passionate Cook, announced the theme for the March edition of ‘Waiter, Waiter’ I was totally stuck. For a moment I thought I could do something on Sri Lankan New Year, which often happens a week after Easter, but this year due to the quirks of the lunar calendar, it isn’t happening until early May. Bah! That was no help. It wasn’t until Johanna came by my site and commented on my rosey lamb dish that I had any source of inspiration. So, you earthlings eat new season lamb at Easter, do you? Fair enough. I eat lamb whenever Goon decides he wants it. But this was as good a time as any to do some herb and spice crusting. Just a couple of days later, Goon decided he had a craving for lamb. I had a lavender and herb crusted canon type thing in mind for the event, so I sent Goon out to find a butcher with some good quality lamb in stock. When Goon arrived home he was not carrying a boned loin of lamb as I’d expected, but two whole rib racks. I’d never cooked these before but I knew Goon had a thing about them. He’d seen them in the shops and thought they looked cool.There had been many shopping trips where I had to stop him picking them up ad hiding them amongst the other items in our trolley. Of course, the moment he started craving lamb and went shopping unsupervised, they were the first things he thought to pick up. The only thing that bothered me about these was the price tag on them. £7 per rack. Well… at least it looked like a lot of meat. I was anticipating a fair bit would be left for lunch tomorrow. Typically, after spending all that time feeling smug and thinking that I was being clever making my roast lavender lamb, it turns out that the French have been doing it for years, particularly around Provence. The recipe I used was fairly similar to the traditional one. I’m sure this will work with any roasting joint of lamb so long as the roasting times have been altered accordingly. First of all, coat your lamb joints in a bit of dijon mustard. Then take abouit two tablespoons of fresh thyme leaves and about 15 rosemary leaves and chop them finely. Then get a level tablespoon each of coriander seed and dried lavender and grind these. Mix the herbs and spices and pat the mixture all over the meat. Completely ignoring the rubbish Tesco cooking instructions, I cooked my lamb for 25 minutes at 200C and then rested it for 15. It turned out quite a nice medium rare. Goon’s was properly rare. I tried to convince him to swap but he growled at me and kept a tight grip on his plate. We had our lamb racks with a side of butterbeans crushed with garlic, cream and thyme and steamed purple sprouting broccoli. I didn’t think this dish needed a sauce but I suppose that if I was going to make anything, it would have been a light red wine reduction. I was impressed by the flavour of the herb crust. The lavender was very prominent and was complemented nicely by the herbs. I couldn’t believe how quick this was to make! The whole thing was done in 40 minutes and probably eaten in ten. Given the amount of meat we had, there was suprisingly little leftovers. It seems that when Goon said he was craving meat he REALLY meant it. So there is my fairly late entry to this month’s ‘Waiter, Waiter,’ hosted by Johanna. Thank goodness she came by the site or I’d never have thought of anything to enter!